Today we take a look at some of the past merchandise, that Christina Aguilera had her name signed to during her debut years. 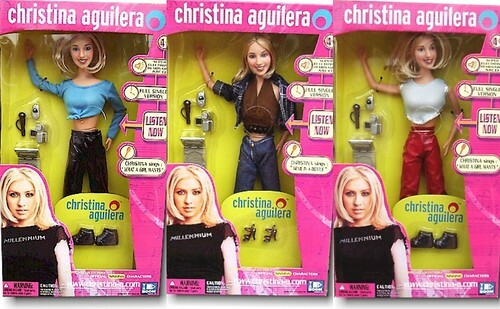 Christina first came face to face with her miniature self on the U.K TV show TFI Friday Each doll had the full radio version of the songs What A Girl Wants and Genie In A Bottle and all came equipped with a matching outfit from the related music videos, plus accessories. The white plush bear, came in around the same time as the beanies and the beanie babies, with only 15,000 manufactured getting your hands on one might not be quite so easy. However If you're one of the lucky ones, EBay have these listed occasionally, but look out for the fakes. All the authentic bears will have the mass number written on the tag.